Pack of 100 Certificates - Armour-Dial, Inc ( Now Henkel Corporation )- Price includes shipping costs to U.S.
Home > Certificate Quantities for Educators / Business Promotions > Pack of 100 Certificates - Armour-Dial, Inc ( Now Henkel Corporation )- Price includes shipping costs to U.S. 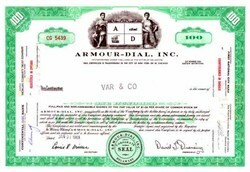 Pack of 100 Certificates - Armour-Dial, Inc - Price includes shipping costs to U.S. Beautifully engraved certificate from the Armour-Dial, Inc This historic document was printed by the American Banknote Company and has an ornate border around it with a vignette of an eagle. This historic document was printed by the Security-Columbian Banknote Company and has an ornate border around it with a vignette of an allegorical man and woman sitting beside the company's logo. This item has the printed signatures of the company�s president and secretary. Dial Enters Its Third Century of Satisfying Consumers Consumers first started using our products in the mid-1800s. Today, shoppers continue to fill their baskets and stock their pantries with value products developed, made and marketed by Dial employees. Brands known and trusted by American consumers are used to feed their families, wash their clothes, bathe their bodies and freshen their homes. 1868 - An eyewitness to the California Gold Rush and its aftermath, Philip Danforth Armour returns to the Midwest and strikes it rich - processing food for the prospectors. Today we offer consumers Armour Star canned meats. 1880 - A vast deposit of borax, nature's magic water softener and cleanser, is discovered in Death Valley, Calif. Soon teams of 20 mules are pulling 12-ton wagons across 165 miles of hot desert to the railroad. Today we market it as 20-Mule Team Borax. 1888 - Armour enters the soap business, producing a laundry bar called Armour Family Soap. 1913 - To keep customers happy, peddlers of America's first aluminum cookware perfect a scouring pad that combines steel wool, jeweler's rouge and soap. They call their brilliant idea Brillo. 1922 - The first jug of Purex Bleach, to be followed by a superior phosphate-free laundry detergent, is formulated in the garage of a house in Los Angeles. Today, Purex is the reigning value detergent and Number 2 brand. 1930 - Backed by decades of research at his clinic in Springfield, Mass., John H. Breck, Sr., introduces a premium shampoo pH-balanced for normal, oily and dry hair. In 1936 Roma Whitney, 14, makes her poster debut as America's first Breck Girl. Today Breck products are sold primarily in Mexico. 1948 - Meatpacker Armour prunes a list of 700 names and selects "Dial" to identify the world's first antibacterial deodorant bath soap. During an August heat wave, Dial is advertised in the Chicago Tribune on perfumed, four-color pages promising users 24-hour protection from body odor. 1953 - The slogan "Aren't you glad you use Dial? Don't you wish everybody did?" establishes Dial as the nation's leading antibacterial soap. 1963 - A favorite old-time convenience snack, the Vienna sausage, is packaged in a flavor-protecting, pop-top aluminum can. Fishermen form a Vienna sausage cult of tackle box folklore.Today Armour Vienna's lead the market. 1964 - Dial opens the largest, most modern soap making plant in the world on an 11-acre site 38 miles west of Chicago in Montgomery,IL. 1973 - Dial dedicates the world's largest, most modern meat canning plant at Fort Madison, Iowa, which produces the leading brand of canned meats - Armour Star. 1973 - Tone, the only bath bar containing cocoa butter, is introduced. 1976 - The Research & Development Lab, a world-class food and consumer products laboratory, opens in Scottsdale, Ariz., and quickly earns a reputation for innovative research and development. Today, with the addition of Accounting and Information Technology, it's known as DTAC (Dial Technical and Administrative Center). 1985 -The Purex household and laundry product lines are purchased. Acquired in the deal are such familiar brands as Purex and Trend detergents, Brillo soap pads and StaPuf fabric softeners. 1988 - Exclusive rights are bought to make and sell such home pantry staples as 20-Mule-Team Borax all-purpose cleaner, Borateem stain remover and Boraxo powdered hand soap. In the White House sits President Ronald Reagan, fondly remembered as the host of "Death Valley Days" once sponsored on TV by Borax. 1988 - Armour introduces Lunch Buckets, the first line of microwave cup meals. 1989 - Liquid Dial antibacterial hand soap pioneers a new category in personal hygiene products. Within 10 weeks of its introduction, germ-fighting Liquid Dial rings up $1 million in sales. 1990 - The sales volume of Breck shampoo and other hair care products purchased from American Cyanamid boosts Dial's annual revenue from all consumer products to more than $1 billion. 1993 - The widely known line of Renuzit air fresheners is purchased by Dial from S.C. Johnson, then revitalized and expanded to swiftly move from Number 3 to Number 2 in its category. 1995 - Nature's Accents, a line of premium skin care and soap products, is created for the Company's largest customer,Wal-Mart. 1995 - Dial acquires ISC (International Soaps and Cosmetics) in Guatemala, a manufacturer of translucent bar soaps. Today ISC makes bar soaps for Dial and specialty bath shops. 1995 - Purex introduces Baby Soft, a value-priced detergent to launder baby clothes. 1996 - Early in the year the decision is reached to divide The Dial Corp into two independent companies. By mid-August the process is complete and the consumer products business becomes The Dial Corporation, listed on the NYSE as DL. Dial unveils a new identity and strategic plan to guide its growth into the 21 century. 1996 - Renuzit introduces LongLast AromaSense Candles, entering the growing candle segment. 1997 - Products that don't fit Dial's Strategic Plan are sold or discontinued. Brillo soap pads, and the London, Ohio, plant that makes them, are sold to Church & Dwight. Also part of the sale are Parsons' ammonia, BoPeep ammonia, Sno Bol toilet bowl cleaner, Cameo metal cleaner and Rain Drops water softener. Trademarks sold to others include Bruce floor care products and Magic Sizing and Starch. 1997 - The Scottsdale Campus is created when Dial moves its Headquarters from Phoenix to 15501 North Dial Boulevard in Scottsdale, across the street from DTAC. 1997 - International business grows with the acquisition of Nuevo Federal, a leading manufacturer and marketer of consumer products in Argentina. Separately, we acquire five leading soap brands from Procter & Gamble's Argentina subsidiary (three personal care soap brands and two laundry bar brands). 1998-1999 1998 - Happy Anniversary, Dial Soap! The Company celebrates the 50th anniversary of Dial soap, its namesake brand. 1998 - Dial introduces Hand Sanitizer, a waterless, antibacterial gel for people on the go. 1998 - SpringWater Dial hits store shelves. 1998 - A fifth franchise in Specialty Personal Care is created with the strategic acquisitions of Freeman Cosmetic Corporation, a leading maker and marketer of natural skin, hair, bath and body, and foot care products, and Sarah Michaels, Inc., a leading marketer of specialty personal care gift sets. Dial's own Nature's Accents becomes part of this new franchise. 1998 - One million cases of Dial bar soap are sold to Wal-Mart this year - a record "first" for the Company. 1999 - Dial launches Crystal Breeze, a line extension that's off to a fast start. 1999 - Dial establishes a joint venture with Henkel KGaA of D�sseldorf, Germany, to develop and market a range of enhanced laundry products in North America under the Purex brand name. 1999 - Dial/Henkel LLC makes its first acquisition: Custom Cleaner Home Dry Cleaning Kit, a revolutionary product for cleaning "dry clean only" clothes at home. 2000 - Purex Advanced, a high-performance detergent developed and marketed by the Dial/Henkel joint venture, hits store shelves in the United States, Canada and the Caribbean. 2000 - and beyond - Through acquisitions, joint ventures and internal development, Dial continues to bring innovative new products and line extensions too. The above information was obtained from the Dial Corporation Website at www.dialcorp.com.